In my house, the Easter egg dyeing party has always been just as celebrated as the actual holiday itself. For as long as I can remember, the extended family has gathered to dye eggs. And over the years it鈥檚 turned into a bit of a competition to see who can come up with 鈥渢he golden egg鈥� 鈥� the most impressive of the bunch. But with an ever-expanding crew that includes toddlers, we need simpler ideas that can live up to the stars of years past. 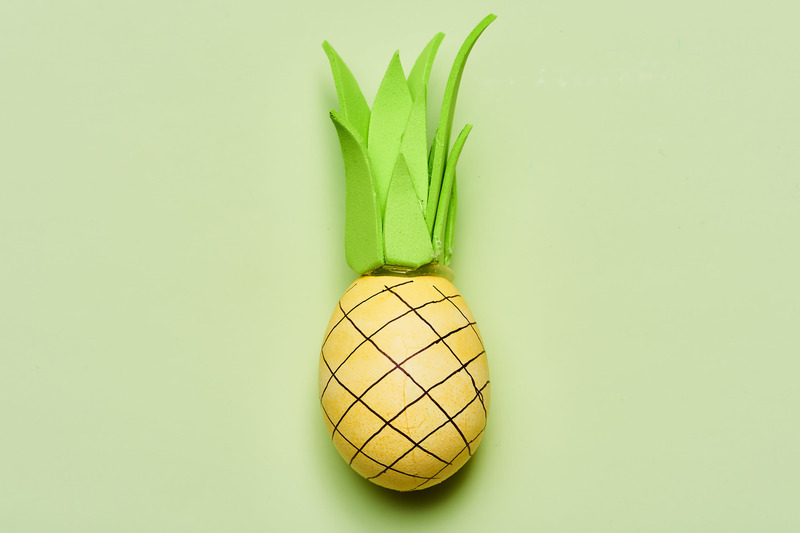 These easy DIY Easter eggs are just that. Although each one requires just a few supplies and a few minutes of your time, they鈥檙e worthy of sitting front and center on your holiday table. Note: If you hard-boil these eggs before you decorate them, we don鈥檛 recommend eating them afterward. If you don鈥檛 want to waste food, simply blow the eggs out of the shells before you start decorating. And then work carefully, as eggshells are fragile! Buy brown eggs and you don鈥檛 even have to dye them. 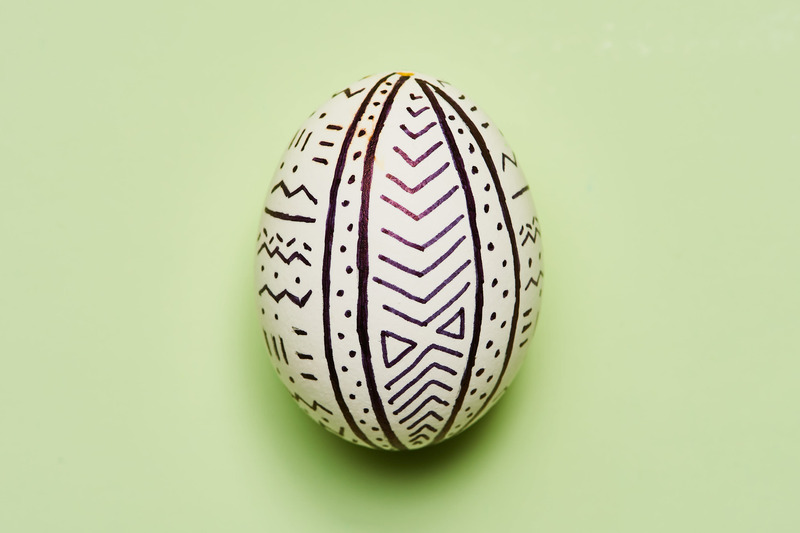 Just use a chalk pen or a Wite-Out pen to draw a modern design on your eggs. 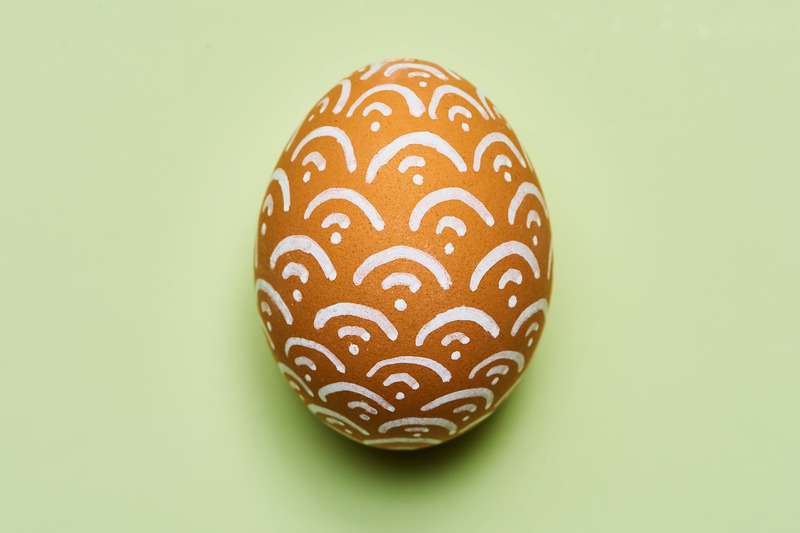 Use-hard boiled eggs and you won鈥檛 have to worry about cracking the shell as you work. 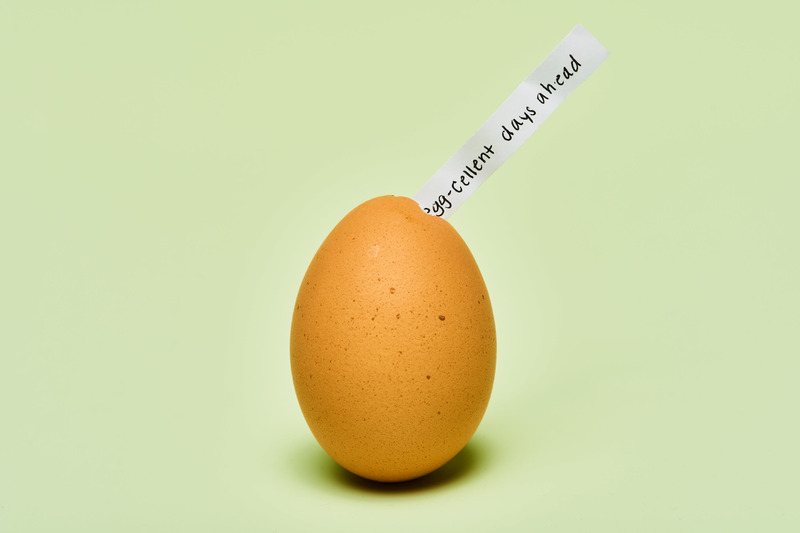 And, actually, you can pull off a similar idea using white eggs, too. Simply grab a thin permanent marker and create an eye-catching mudcloth design. Again, hard-boiled is probably best here. Apply a thin layer of Mod Podge to a hard-boiled egg, then slowly wrap baker鈥檚 twine around the egg. Pro tip: If you end up with small gaps between each row, simply add a second layer of twine to help cover any bare spots. 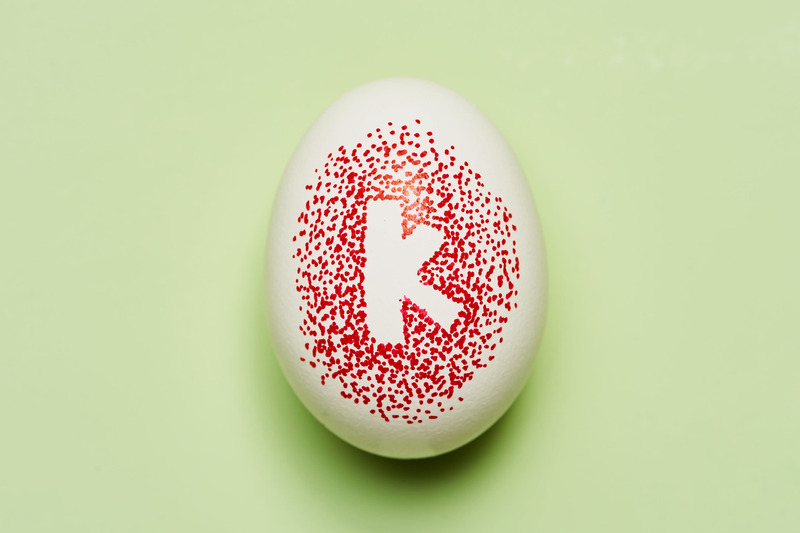 Pick out your initial from a set of letter stickers and affix it to the middle of an egg. Use a thin permanent marker (in one color or a bunch!) to make dots all around the letter, making marks more concentrated closer to the sticker. Remove the sticker. So your drawing skills aren鈥檛 up to par? Apply temporary tattoos to a hard-boiled egg the same way you would to your skin 鈥� with just a little bit of water and a paper towel. This one looks hard, but trust me, it鈥檚 not! Dye a hard-boiled egg orange (most food coloring doesn鈥檛 come with orange 鈥� so mix red and yellow) or start with a brown egg. Then, cut two small triangles and a tail out of orange felt. Next, using the orange tail as a guide, cut a smaller tail out of white felt. You鈥檒l also need to cut two small triangles and a small heart out of the white felt. Using hot glue, apply the orange tail and the orange ears. Then apply the white parts of the tail and ears, as well as the heart. Use a thin permanent marker to draw a nose and eyes. To create an egg that鈥檚 out of this world, paint a hard-boiled egg black. Once dry, use a foam brush to sponge on a layer of blue paint. Repeat with a layer of purple, then a final layer of gold. Finally, apply a thin layer of Mod Podge, then sprinkle with fine silver glitter. Dye a hard-boiled egg yellow, then let dry. Use a thin permanent marker to draw diagonal lines across the egg; draw diagonal lines across the egg in the opposite direction. Cut varying sizes of green craft foam into leaf-like shapes. Roll (and unroll) the leaves, so they have some bend to them, then use a hot glue gun to apply the leaves to the top of the egg. 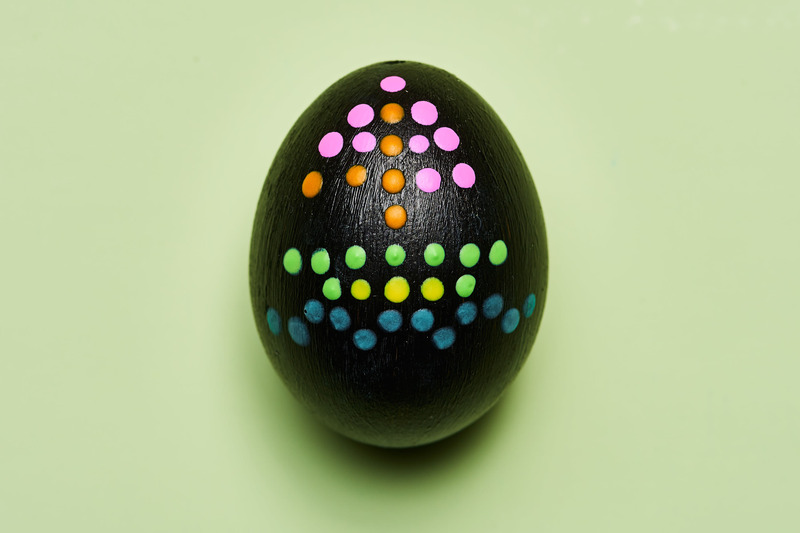 To make an Easter egg that looks like your favorite retro toy, simply paint a hard-boiled egg black, let dry, and decorate with strategically placed dots of neon puff paint. 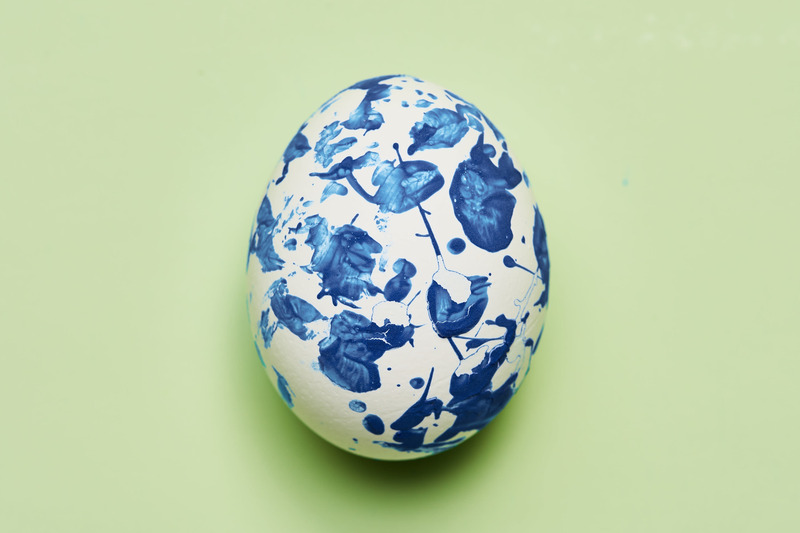 Dip a paintbrush in blue paint, then gently tap the handle to splatter paint across a hard-boiled egg. Repeat until you鈥檙e satisfied with your design. Pro tip: Nestle the egg inside of a small box to minimize mess. 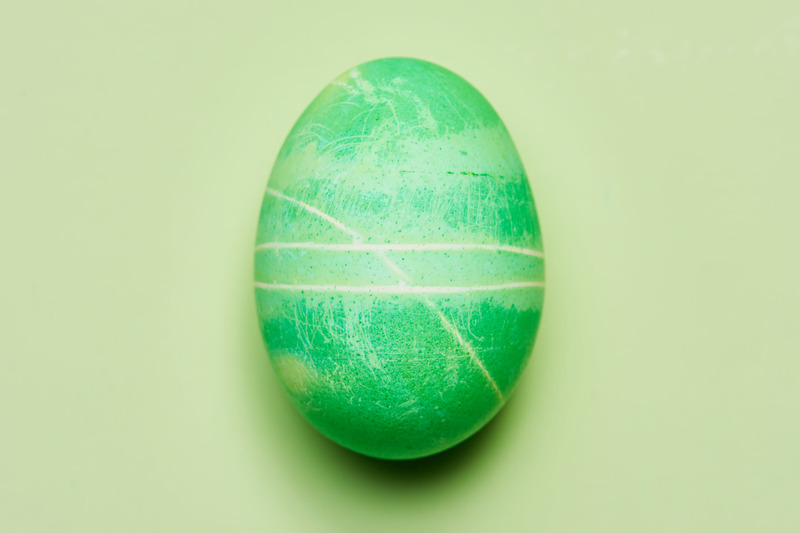 Dye a hard-boiled egg green, let dry, then use a thin permanent marker to draw Xs in a series of vertical lines. Apply a dollop of Mod Podge to the top, then stick on a small pink pom-pom. Nestle your little 鈥減lant鈥� inside a small terra-cotta pot. 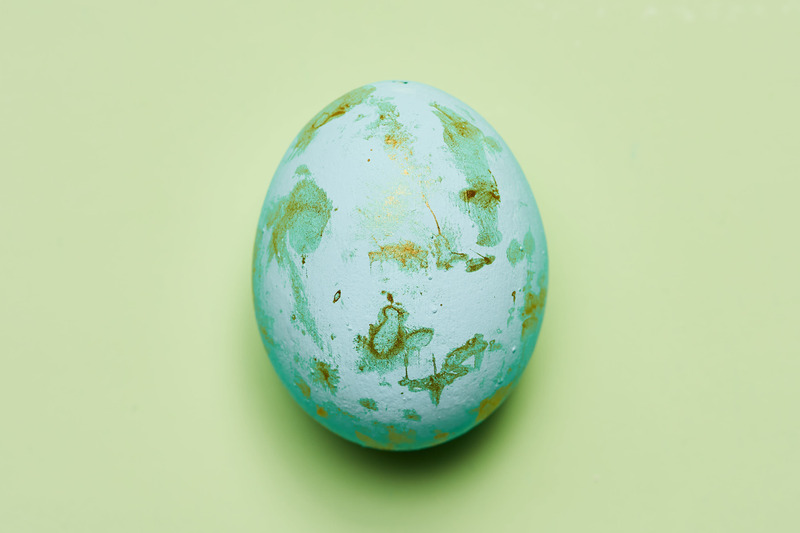 Dye a few eggs in varying gradients of one color, then crack and peel. 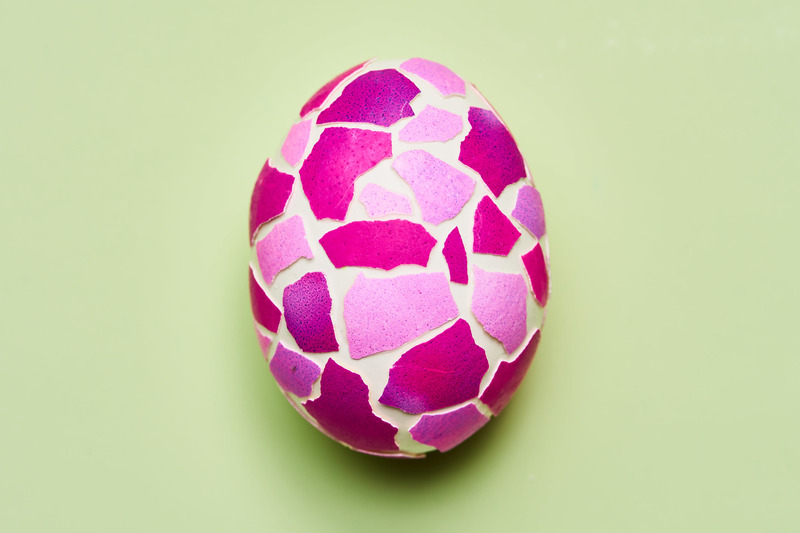 Using Mod Podge, apply the broken pieces to another (plain white) hard-boiled egg to create a mosaic design. Use Mod Podge to apply flat, round sprinkles to a hard-boiled egg in a pretty, patterned design. 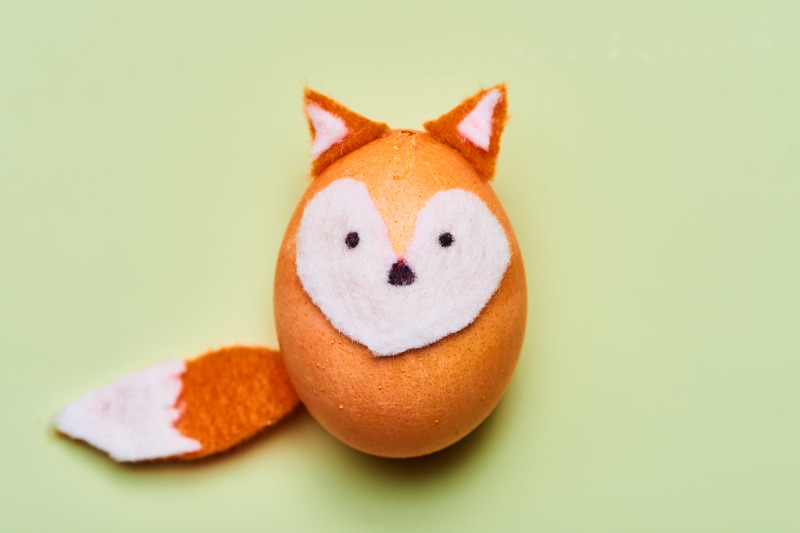 Turn a hard-boiled egg into Peter Cottontail with just a pipe cleaner and a pom-pom. Cut four 2-inch pieces of white pipe cleaner, fold each piece into a loop, then hot glue each one to your egg to create two ears and two feet. Add a pink pom-pom for the tail, then use a thin permanent marker to draw on the face. 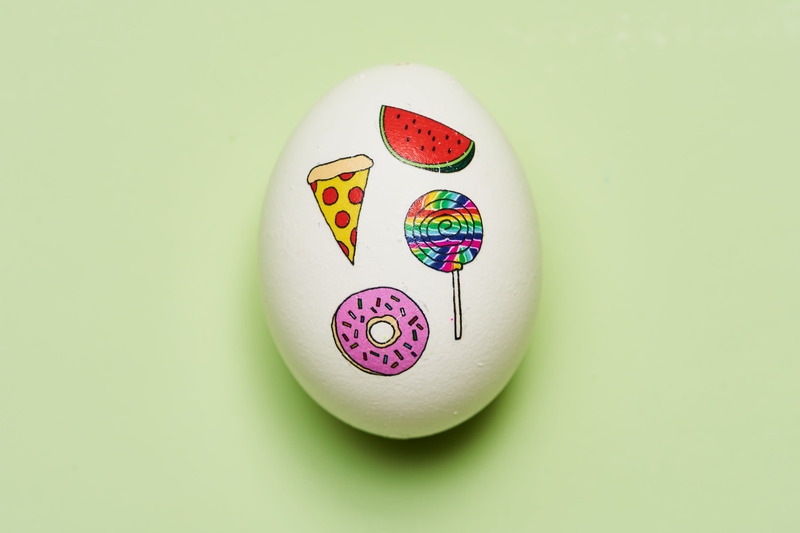 Using a variety of colored permanent markers, draw sprinkles onto a hard-boiled egg. 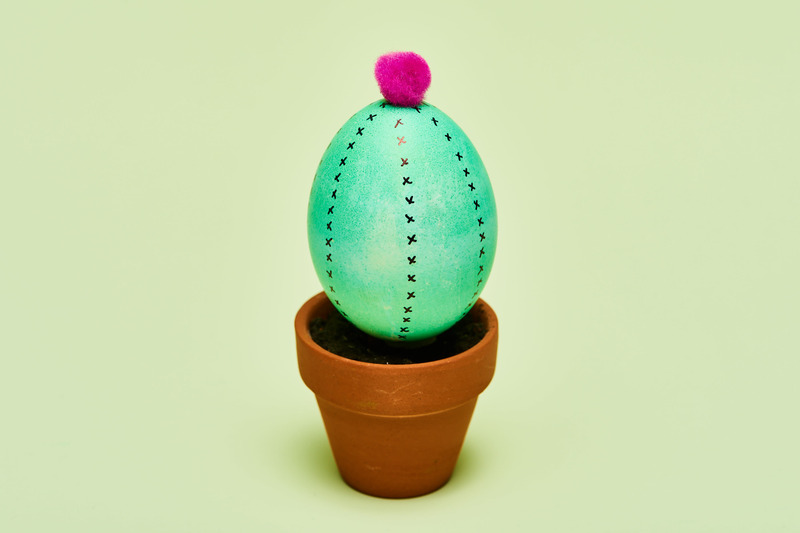 Then, use Mod Podge to glue a red pom-pom onto the top of the egg. Cut the cone from brown cardstock or construction paper, roll, and fasten together with glue or tape. 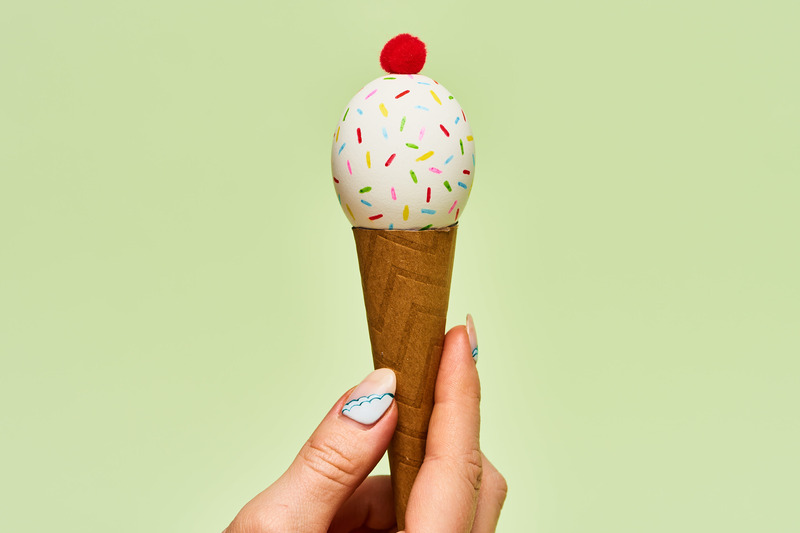 Glue the egg to the cone. Make an Easter egg that Joanna Gaines would be proud of: Apply white puff paint to a hard-boiled egg in concentric circles. Let dry, then apply a layer of high-gloss white acrylic paint to mimic the look of this traditional tableware. 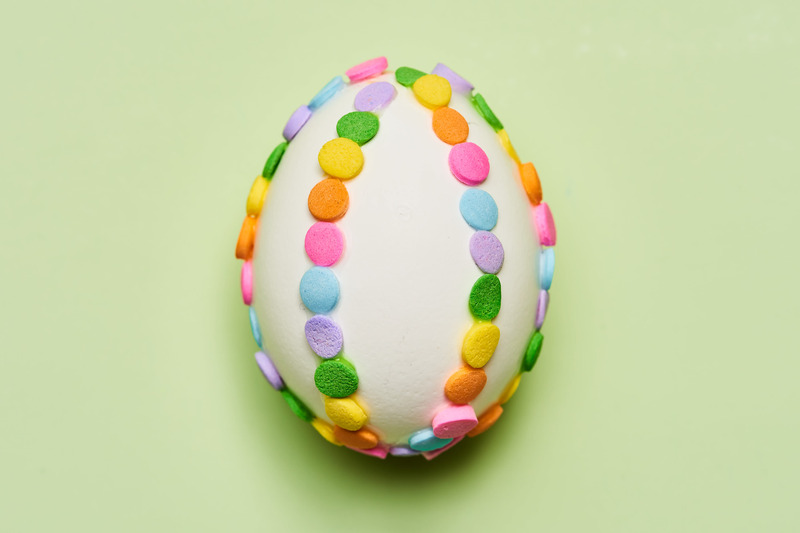 Using a safety pin, gently poke a small hole in the top and bottom of a brown egg. Blow through the top hole, forcing the contents of the egg out the bottom and into a small bowl (Don鈥檛 be wasteful: Make yourself some scrambled eggs!) Once the egg is empty, use the safety pin to carefully widen the top hole. Clean the egg (inside and out) with warm, soapy water. 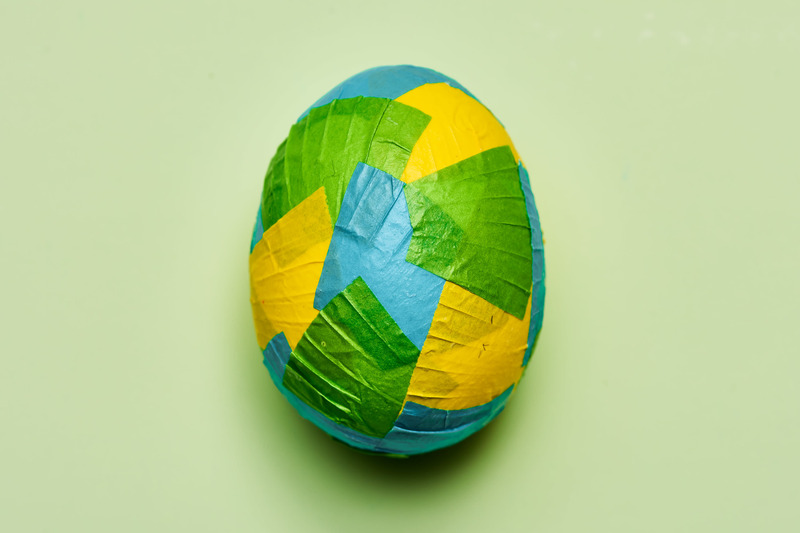 Cut a strip of paper, write out a 鈥渇ortune,鈥� then nestle it inside of the egg. Pro tip: To keep the fortune in place, secure it with a dab of hot glue. 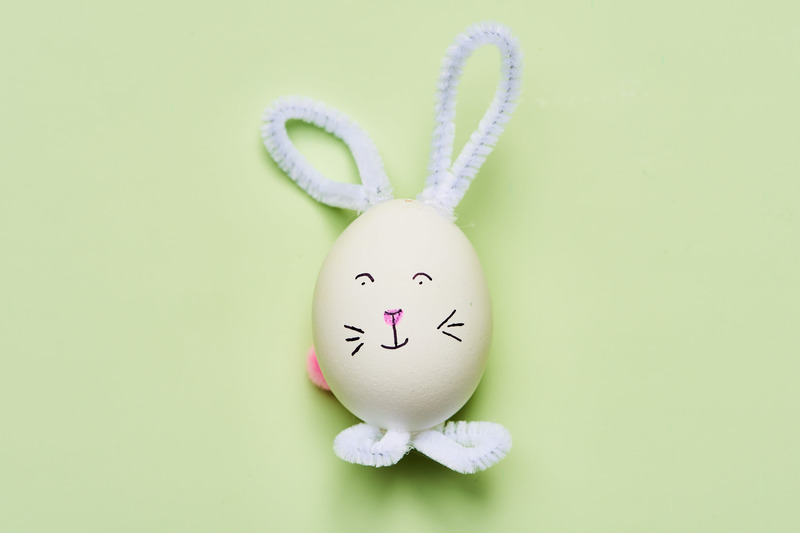 Use a white crayon (or a white birthday candle) to write a fun phrase or draw a picture, then dunk the hard-boiled egg into a cup of dye to reveal your message or design. Pro tip: Write with crayon when the egg is still slightly warm (from the hard-boiling) to give your writing a graffiti vibe. 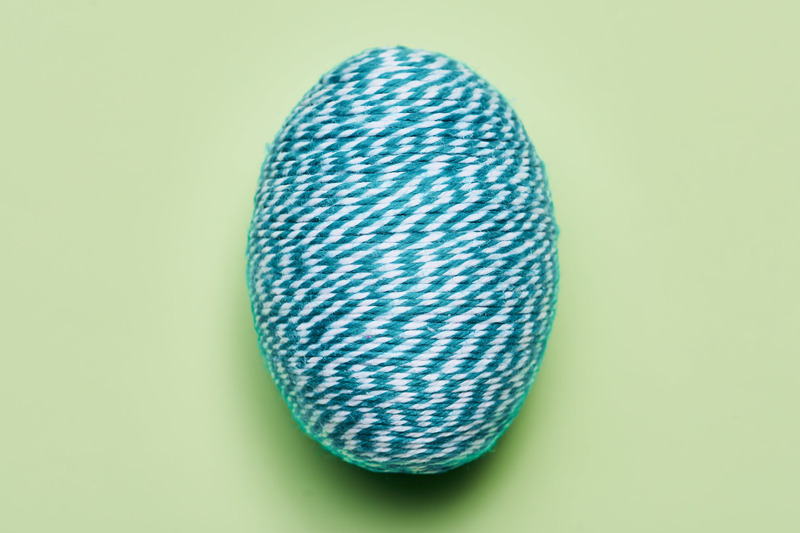 Wrap a hard-boiled egg with rubber bands in the design of your choice, dunk the egg in your favorite color dye, then remove the rubber bands to reveal stripes. Pro tip: Use small rubber bands, as the larger ones may slip off while in the dye. Cut the crimped portion of a cupcake liner into one-inch pieces. 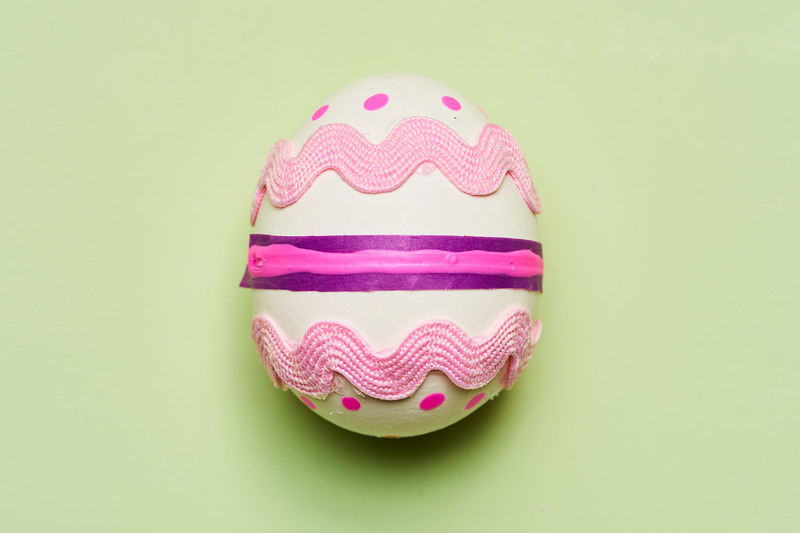 Use a foam brush to apply Mod Podge to a hard-boiled egg, apply the cupcake liner pieces to the egg in a decorative pattern, then apply another layer of Mod Podge over the entire thing to seal. 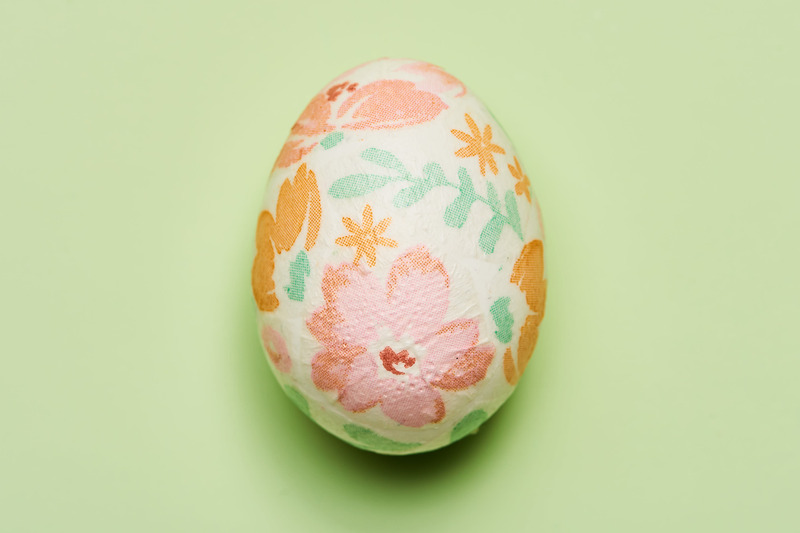 To get an artful look that would take hours (and a lot of skill) with a paintbrush, decoupage a hard-boiled egg with your prettiest paper napkin. 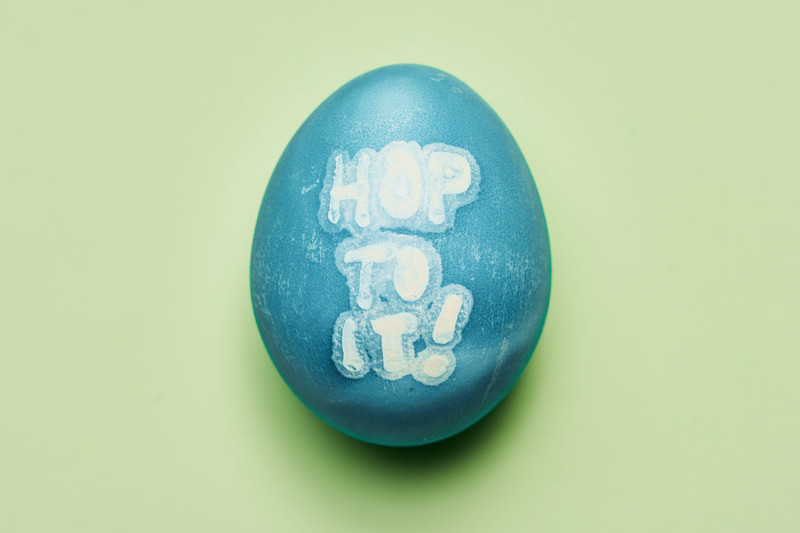 Simply cut out the best design elements, then apply the pieces to the egg using a foam brush and Mod Podge. Once your design is complete, seal the whole thing with another layer of Mod Podge. 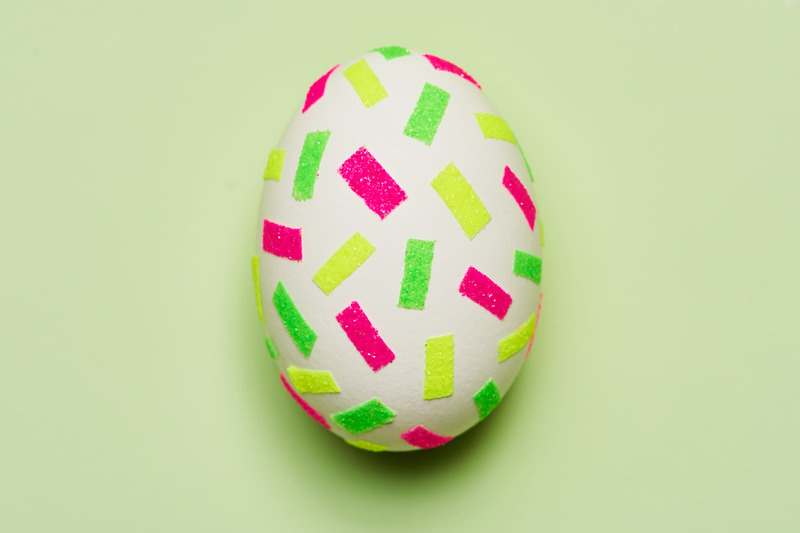 Use washi tape and puff paint to create a slightly modern version of a old-timey Easter egg. Cut two 3-inch pieces of rick rack trim and, using glue, wrap them around opposite ends of the egg. Add a strip of washi tape in the middle and complete the look with some puff paint (dots and stripes) wherever you see fit. Fill a shallow bowl or pan with a layer of cool whip, place a few drops of food coloring throughout, then take a toothpick and drag the dye throughout. Once you鈥檙e satisfied with your design, roll a hard-boiled egg in the mixture. Remove it, and dab it clean with a dry paper towel to reveal a marbled design. 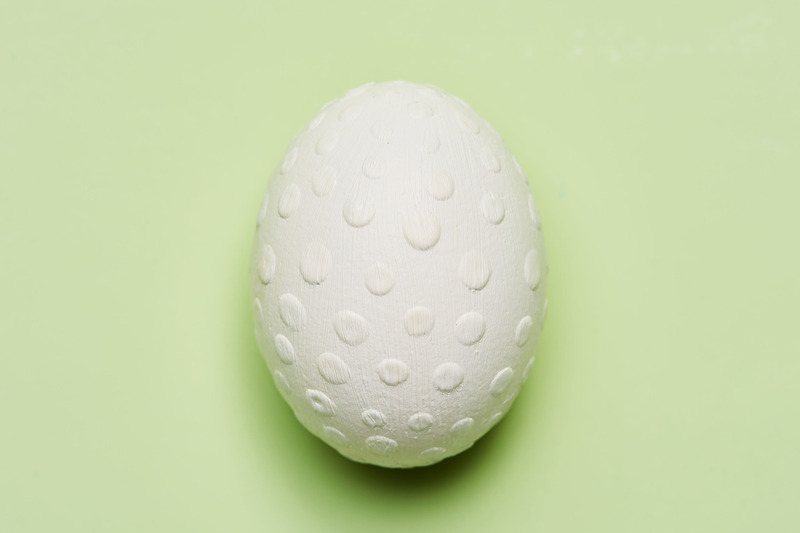 Press a doily against a hard-boiled egg to use it as a stencil. Fill in the holes with a permanent marker to reveal a lacy design. Pro tip: Use multiple colors to create a more modern look. Paint a hard-boiled egg with matte blue acrylic paint and let dry. 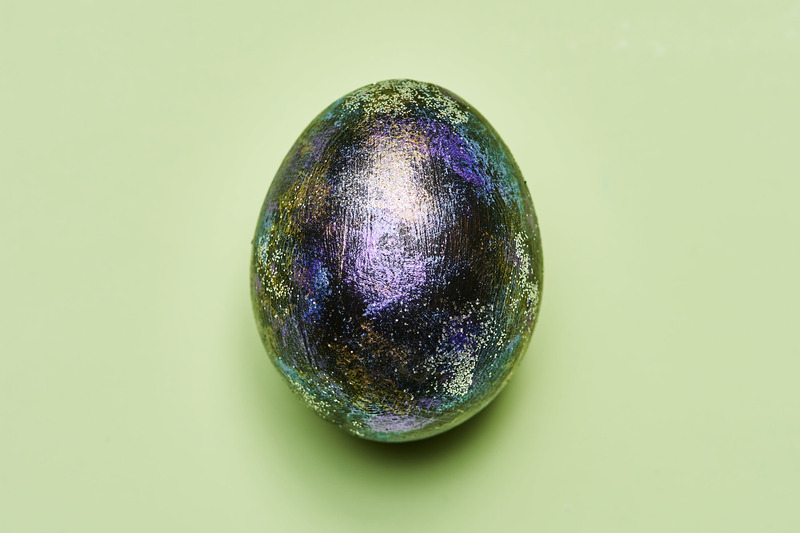 Then, use a foam brush to sponge gold paint onto the egg. Even if you鈥檙e not much of an artist, you can make good use of a set of watercolors. Dab a dye-filled brush onto a hard-boiled egg, then blot the section dry. Repeat until your egg is fully covered. 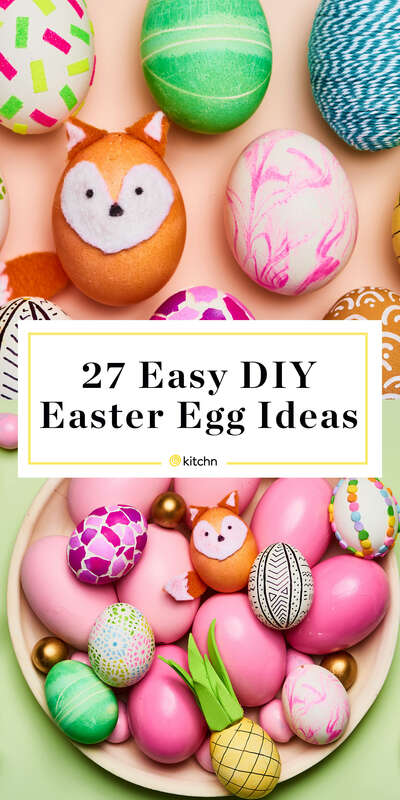 Cut or rip off small pieces of washi tape and stick them to your egg every which way. That鈥檚 it. You鈥檙e done.